Whatever the season, pulling on your wellies and going for a stroll in the forest is always a feast for the senses. In Spring, we see carpets of daffodils and bluebells, in Summer; wild flowers are at play. Come autumn, the forest floor is strewn in bright amber and copper leaves and in winter, the morning frost can bring delight to everything it touches. But one thing remains tall and very prominent during the lands changing seasons; trees. Trees provide breathable air, building material, fuel, food, shelter, medicine and not forgetting books. Without trees, we could not live. Aristotle did his best thinking in the olive groves around Athens, Buddha found enlightenment beneath a bo tree, and Isaac Newton realised his theory of gravity when an apple fell from the tree under which he was sitting. Well-known to harness the power of self-healing, trees give off wood oils called ‘phytoncides’ to protect themselves from germs and insects. When inhaled by humans, these oils have a beneficial impact on our nervous systems. Aspirin derives from willow bark, tea tree oil is used to fight skin infections and quinine, the basis of anti-malarial drugs, can be found in cinchona tree bark. Doctors are now realising the positive impact the environment plays in patient’s recovery and Mount Sinai Hospital in New York was even redesigned so that the recovery wards all have a view of Central Park. Forest bathing is an ancient technique practised by cultures all over the world and is growing in popularity across the UK and US. By combining mindful breathing in the presence of trees we make a connection with nature, and that connection is said to have positive effects on our wellbeing such as lower heart rates and blood pressure, reduced cortisol (the stress hormone), and boosted immune systems. “Our forest environments can be viewed as therapeutic landscapes. Forest air doesn’t just feel fresher and better – inhaling phytoncide seems to actually improve immune system function,” concluded researchers from Japan’s Chiba University. So how can we get involved in forest bathing? Well, the key is to slow down. Have you heard of the ‘slow movement’? It advocates a cultural shift toward slowing down life's pace. Forest bathing is all about being mindful and in the moment, so leave your bikes and maps behind and enjoy discovering the land using your senses. Whatever the season, heading for the forest is always a great idea. With the arrival of the summer sunshine, a cool walk through the shades of the trees could be just what your soul needs. Why not go, book in hand, and sit beneath it's leafy canopy for some much needed R&R? If you are interested in Forest bathing visit www.forestry.gov.uk and go give one of your local trees a big, thankful hug on Wednesday 16th May which is ‘Love a Tree’ Day. 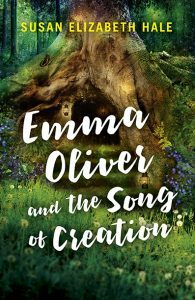 If your little explorer loves the open air, then Susan Elizabeth Hale's book Emma Oliver and the Song of Creation is just for them! Eleven-year-old Emma doesn’t know that she comes from generations of tree singers, passed from mother to daughter. She doesn’t believe she can sing. Her ailing grandmother has just come to live with the family. Her father is hardly ever at home. Her mother has been acting strange. To add to Emma’s troubles, her mother’s great uncle from England is coming to stay. Then, a strange old woman wearing a hat full of feathers appears mysteriously in her garden. She gives Emma a white swan feather that emits a haunting melody. Emma’s only solace is the oak tree in her garden, which she names Annie Oakley. What she does not yet know is that Annie is part of a network of tree spirits who disguise themselves as old women. These spirits have come to Peachtree City to help Emma remember her mission to sing the Song of Creation and save the Great Mother tree. Emma Oliver and the song of Creation is available to buy now (Our Street Books, £6.99).